So my sister, Lynn, convinced me to enter into a food blogging event from Delicious Vietnam to promote and explore the diversity of Vietnamese cuisine. 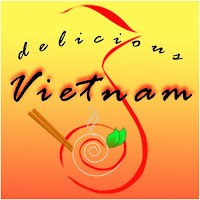 The two founders a food lovers journey and ravenous couple have some great Vietnamese recipes. 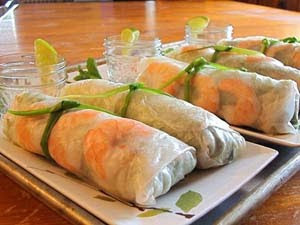 Growing up in Nome, Alaska my mother has adapted a lot of Vietnamese cuisines with local caught food. Such as Moose pho instead of beef, bun rieu (tomato and crab noodle soup) with Alaskan king crab instead of dungeness, and various vietnamese fish dishes with local salmon instead of maybe the traditional catfish. Last year I entered a contest and won $100 for third place and our local Fisherman's Fair hosted by Norton Sound Economic Development Company, one of the rules was to make a dish using cod provided by the seafood plant in Nome (nortonsoundseafoodproducts.com). Using my Vietnamese/Alaskan background I ended up making Alaskan Cod Rolls which I posted to my recipes tab. Click on the link below to go to the post. I think the great thing about Vietnamese food is in its adaptability. :) Great job! These look delish! Glad you posted.